Energy. It generates the electricity that powers our communities. It heats our homes and the buildings we work in. It fuels the vehicles, boats and planes that get us from place to place. The GNWT Energy Division is committed to getting the most out of our energy systems. We want our communities to have energy that is secure, reliable, and affordable, while reducing greenhouse gas emissions that contribute to climate change. Today, the Northwest Territories (NWT) is an acknowledged leader in the use of biomass heating systems and we rank second in the country in installed kilowatts of solar energy on a per capita basis. The GNWT also funds some of the most progressive energy conservation and efficiency programs in Canada, delivered by our partners at the Arctic Energy Alliance (AEA). We continue to engage with community and Indigenous governments, stakeholders and the general public on building regional energy supply projects to ensure a bright energy future for the NWT. 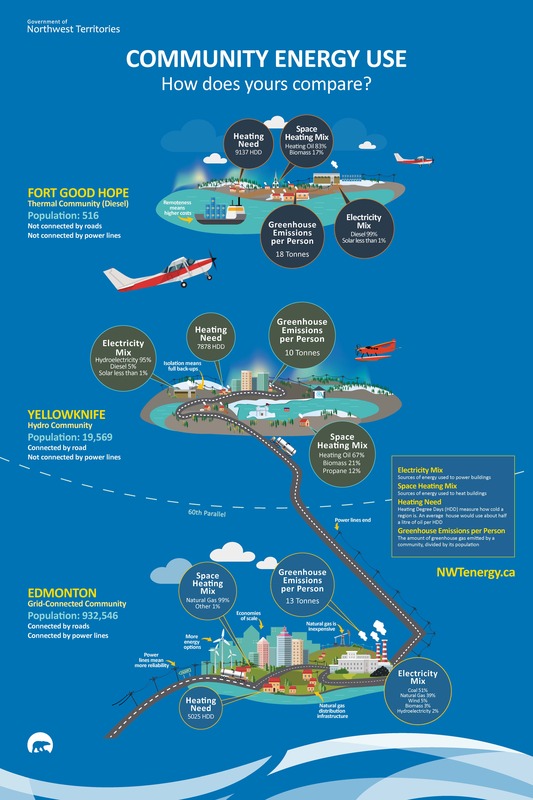 The NWT is not connected to the North American energy grid, which means we have to rely on ourselves to meet our energy needs. Finding affordable energy sources and providing efficient energy services to remote communities across such a vast and rugged terrain is a big challenge. To help mitigate this challenge, the NWT is working to diversify its energy mix—including the increased development of renewable and alternative energy resources. To download and print a community energy poster, click the PDF below.